Although this is Thanksgiving Day in these here United States, this article is not only for today, nor is it just for Americans. People get overwrought about their concerns (some of them are mighty small if you get the right perspective), and we tend to shilly-shally about thanking God for the things we do have. Some of us commence to feasting with our friends and kinfolk, watch the Big Game, doze off (blaming it on the nonexistent "turkey coma"), have a few laughs, and saddle up for home. I hope y'all thanked your hosts for the victuals and hospitality. Did you say a prayer of thanks earlier? Just curious. Some people get their Thanksgiving meal at the homeless shelter. No, I'm not feeling bad about the good things I have, and neither should you. Just giving a bit of perspective. "She passed away thirty years ago, Cowboy Bob!" No, I'm not talking about a person. It gets a mite confusing, and mayhaps someone can explain it to me simple-like so I can understand it better. What I do understand is that the grace of God is a free gift; it is his unmerited favor that cannot be earned. God set the stars in the sky, made the sun and moon, established laws of physics, gave us understanding of the laws of logic, lets the rain fall on the just and the unjust —all of this is called common grace. Atheists mock God, and too many of God's people want the gifts, but not the Giver of gifts (Rom. 1: 19, 21). I reckon that when we are ungrateful for God's gifts, we are being like unbelievers, saying in our hearts that there is no God (Psalm 14:1). That is, when we take God's grace for granted or choose to sin against him, we are acting like he is not there. You savvy that? We are saved by grace through faith (Eph. 2:8-9), even though we deserve death (Rom. 3:23). Salvation is his gift (Rom. 5:8, Rom. 6:23) and we become children of God (John 1:12). Jesus died on the cross for your sins and mine. He was buried and then bodily rose from the dead on the third day, defeating death. God's justice requires Hell for us because we are all wretched sinners, but in his mercy (giving us what we do not deserve), we can repent and have eternal life. When Christians sin, we can make things right with God (1 John 1:9). Giving thanks to God is important! 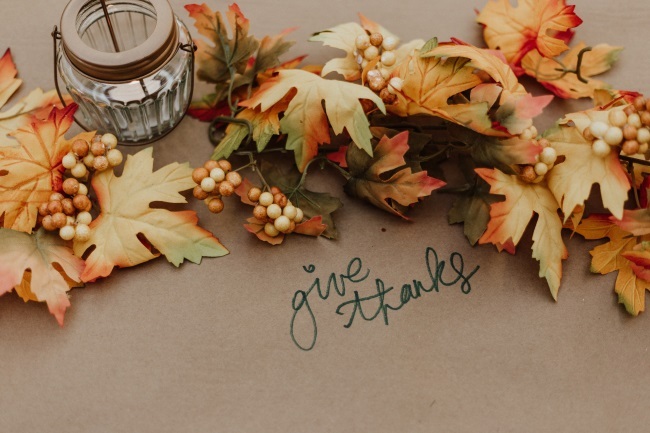 Learn a bit about how thankfulness is expressed in Scripture. It is seen in the Psalms, and look for the word "thanks" in the New Testament as well. Followers of Jesus have been redeemed by the blood of God the Son, the Creator and Sustainer of the universe. Stop and ponder all that he has done for you, and give thanks.